I just recently read an article that raised again the prospect of a new national flag for Australia. While I am by no means an motivator for change I have always felt a truly Australian flag was a good idea. So here is my go at it….with not a jot of “green and gold” to be seen. You can leave that for the footy jerseys. 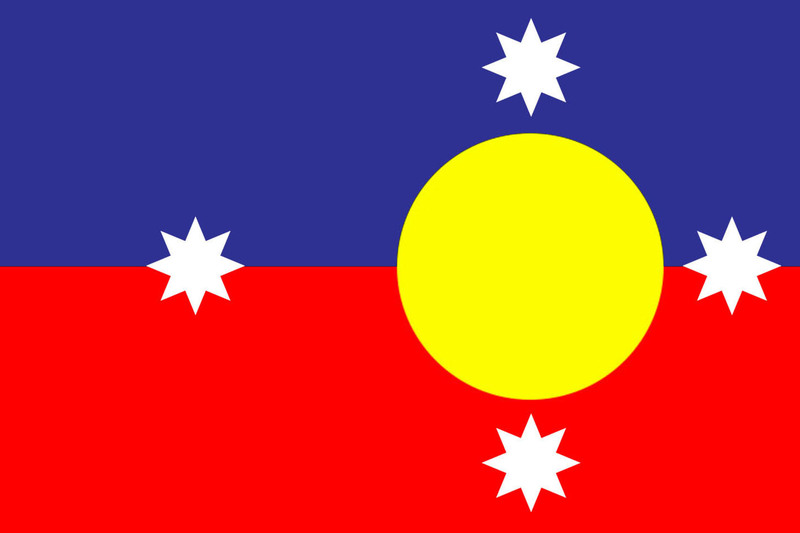 One of the reasons I have always felt it shouldn’t be so difficult to find our new flag is that we (the collective we) already have a great Australian flag – in the Aboriginal flag….which I think is wonderful in its simplicity and perfectness. The Australian Aboriginal Flag was designed by artist Harold Thomas and first flown at Victoria Square in Adelaide, South Australia, on National Aborigines Day, 12 July 1971. It became the official flag for the Aboriginal Tent Embassy in Canberra after it was first flown there in 1972. Since then, it has become a widely recognised symbol of the unity and identity of Aboriginal people and is now recognised as a flag of Australia. It would be neither fair nor right to simply take on the Aboriginal flag as our national flag – and I think it would be far too contentious on both sides of the fence (why do we even still have fences?). It also needs to be recognised that Harold Thomas remains the holder of the copyright for that design. But I have always believed it held the core of what our new flag should be. To begin, I replaced the black with blue. You may find this a contentious place to start, but before you get outraged please see below. The blue for our magnificent sky, but also retaining the blue from the traditional red, white and blue. Then there is the other significant symbol – the Southern Cross. We all know we have two versions of the Southern Cross. 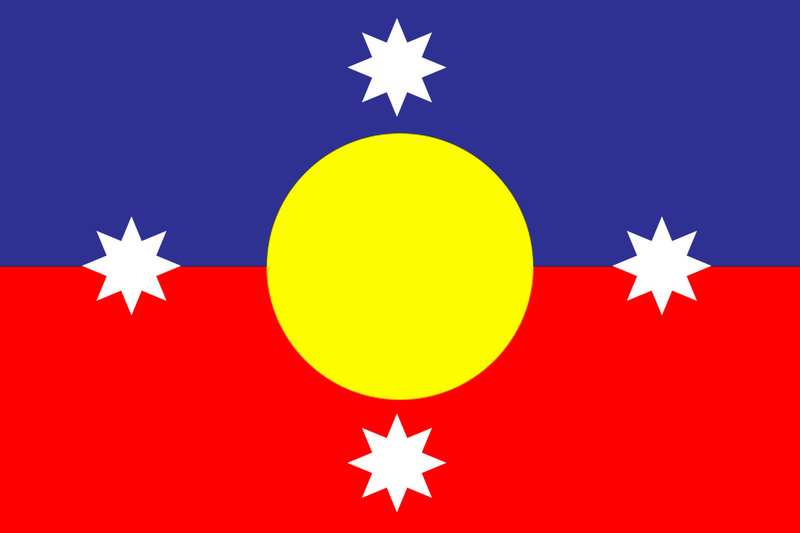 The Eureka Stockage southern cross is again contentious, but at least is dares to reflect the cross in an alternate way than the true-to-life arrangement on the current flag. So I used the Eureka stars and began with arranging them around the golden sun. This is where a little bit of graphic design comes in – because it doesn’t look right. Think then of the “kite” formation of the cross and if you turn it sideways and shift the sun off centre (centring it instead in the right-hand “square” of the flag) you get a much more pleasing effect. OK, so we have lost the 5th little star of the traditional Southern Cross, but you can’t have everything. Gone too is our 7-pointed star, but I would argue it is replaced by the all-encompassing golden sun. 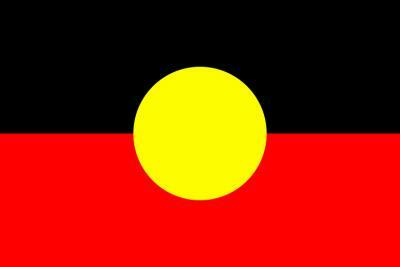 One of the reasons I wanted to base it on the Aboriginal flag is i believe they should be flown together and our National flag should recognise the traditional owners of this land. They would look “right” together in my opinion. So with apologies to Harold Thomas (and most likely the entire contingent of RSL members) I reveal Australia’s new National Flag….well my go at it at least.